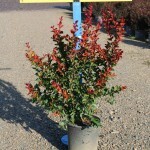 A large shrub or small tree with cherry red flowers held on 6-10" panicles from July thru September. 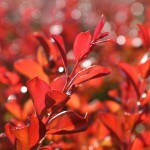 Spring foliage emerges reddish, maturing to dark green with red fall color. it grows best in full sun and most well-drained soils. It is drought tolerant once established. Use as a specimen or in groups. PP 10,296.